Austin: Like the HOVR Infinite, the Phantom is a daily trainer with an identical offset (8mm) and a comparable weight (10.6 oz. in a men’s nine). From a design standpoint, the Phantom is sharp. There’s an unmistakable sleekness in the stretchy, knit upper (although it feels like a mesh). If you like shoes that ooze snugness and security, this is one to consider. In fact, you will need some serious elbow grease (or a shoehorn?) to get your feet into the Phantom. More thoughts on that below. 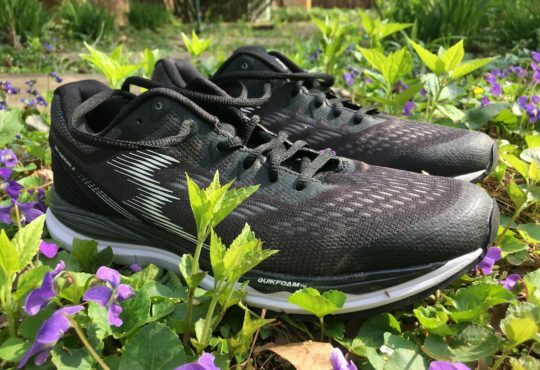 I rarely make remarks about sizing as most shoes I review fit great in terms of length, but I would suggest a half-size increase in the Phantom as the toe box volume is low and the forefoot tapers. I was concerned about my last toe rubbing, but I didn’t observe any hot spots. The ride is okay, nothing to write home about. I stuck with easy efforts for this review, and wouldn’t recommend going beyond that, for reasons I will cover below. That said, I was pleasantly surprised by how much I enjoyed the feel of the HOVR foam underfoot. 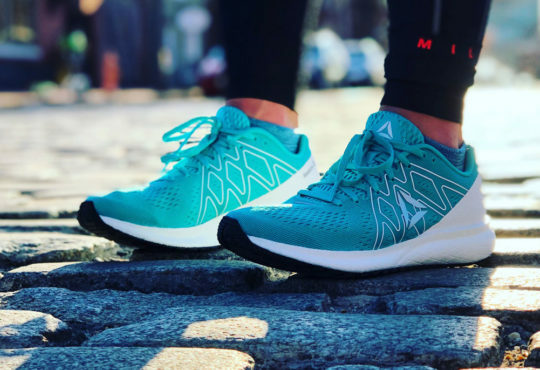 While the Phantom SE is a bit heavy for a neutral trainer (8.8 ounces in a women’s 8), it felt much lighter. The fit of the shoe, once you get it on, is also solid. One of the complaints I saw mentioned several times about the prior version of the Phantom was a hotspot on the lateral edge of the toebox, created by the inner angling of the midsole in that area. I took a look at my shoes and, while that angling is still noticeable, I didn’t have any issues with hotspots or rubbing here. 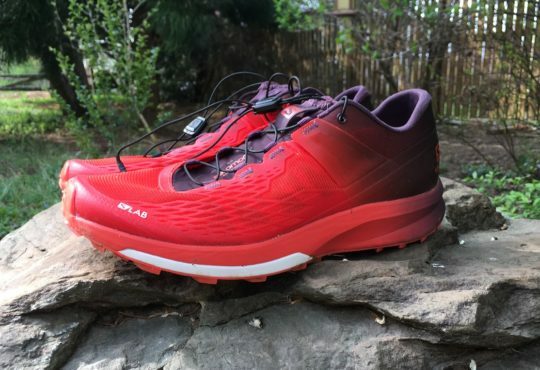 The knit upper is quick-drying but also structured enough that, combined with the 3D cage, the foot feels secure. 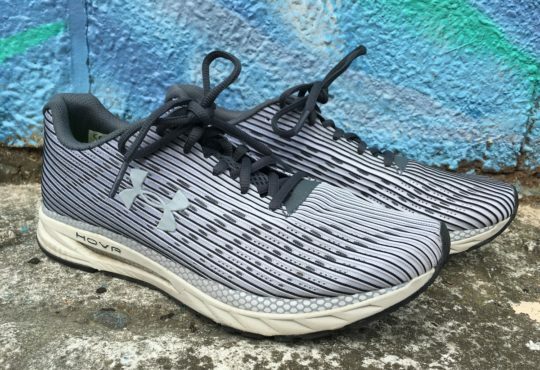 The Phantom SE is one of Under Armour’s Connected shoes, meaning that the right shoe has a built-in Bluetooth sensor that tracks your metrics for every run and then automatically syncs and uploads to MapMyRun. This is pretty sweet, although it requires that you use MapMyRun; if you’re a Strava user (which I think most people are), it isn’t all that helpful. I’ll include this in the good, even though I disagree on this point, but I got a LOT of compliments when I wore these. I live in Baltimore, so I think in general there are a lot of die-hard UA fans here, and that may account for some of this. Austin: My critiques of the Phantom outweigh the accolades. In the first run, they felt like boots. Cowboy boots. It’s not what I hoped for as I set out with my son in the B.O.B. stroller. The Phantom has a high tongue, scrunchy heel collar fabric, and a sizeable external plastic counter. The 8mm offset ran more like 10-12, and my toes felt cramped up front. While I’m on the subject of the heel collar, I would suggest that you carefully consider the socks you choose for the Phantom. I started with a lower cut sock and noticed some redness around the Achilles tendon. I opted for mini-crew in all subsequent runs to avoid any risk of blisters. Locking the feet down is tricky too. Some may find no need to even lace the Phantom; I cinched up the laces for security as I tend to do with all my sneaks, but I felt some pressure on my instep at the top loop where the laces crossed. Erin: I have one major complaint about these shoes, and be forewarned that I get pretty heated when I really get to thinking about it. The MapMyRun thing is like, “ok, I guess there are people who still use it, and they’re probably the same people that run with their phone in an armband.” It’s not for me, but whatever. But who designed these shoes?? I want to meet the people who OK’ed these at every point in the design process. I get that the sock upper is a thing now, and there are plenty of shoes that execute this well; the Nike Epic React is a good example. Actually, I used to think those were kind of a pain to get on, but no longer, for I have been through the Olympic wrestling match of getting the HOVR Phantom on my foot. I am mystified. Perplexed. Confounded. Did the wear testers provide no feedback on this point? The sock liner is very dense, which is nice if you ever manage to get the shoe on your foot. 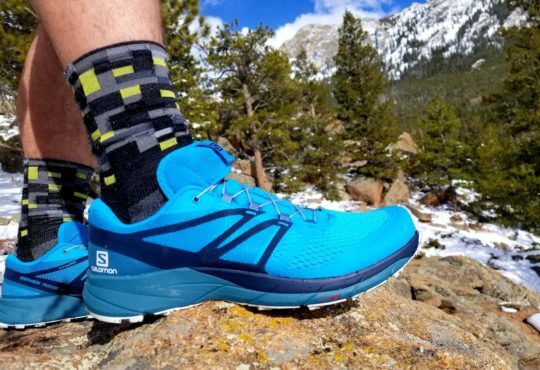 The external heel counter is a large, hard piece of plastic that resists your efforts at every turn. Also, the tongue part of the sock liner comes up so high that, for me, anyway, it rubs on my lower leg. Maybe this could be remedied by wearing tall socks, but to be honest this is all just way too much effort for a running shoe. 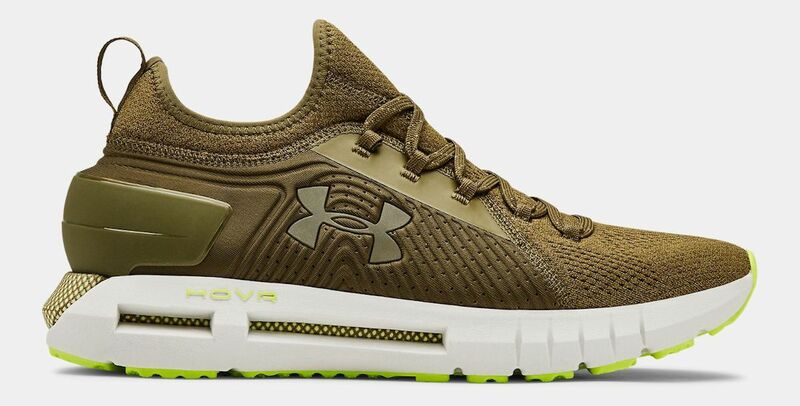 Erin: The Under Armour HOVR Phantom SE is a shoe that exemplifies form over function, and it’s really too bad, because it has the potential to be a solid neutral trainer. 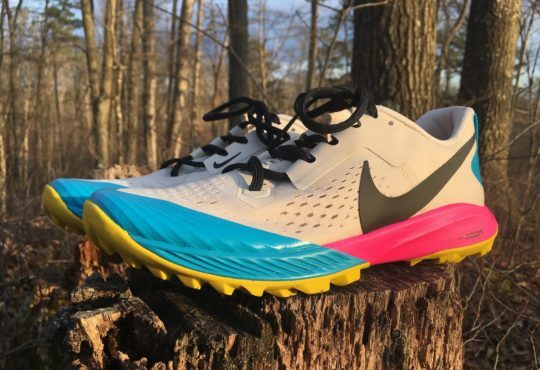 If you’re still interested in trying these because you like a challenge and/or MapMyRun, I’d recommend going a half size up, because these run a bit small (and you’ll need every extra millimeter you can get). If you to buy them strictly for the compliments you’ll get, then you can pick them up for $140. 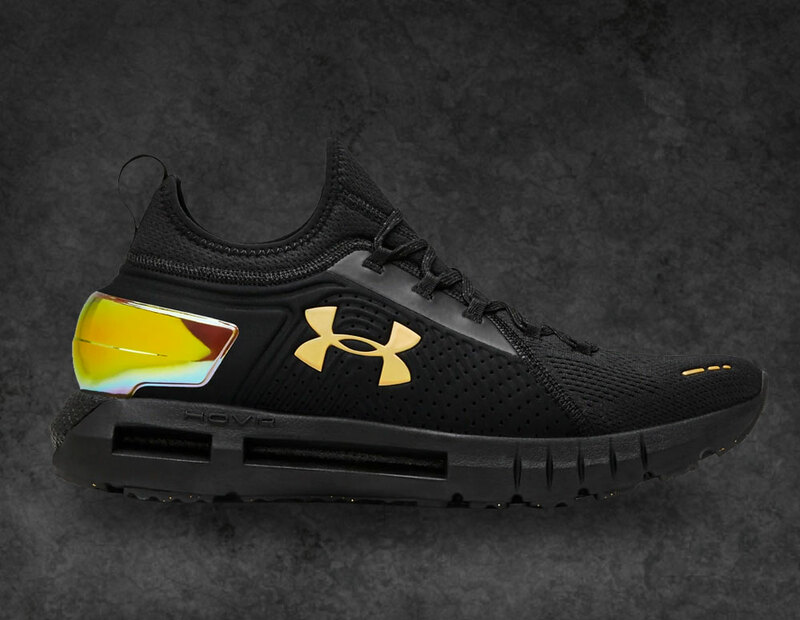 Austin: Runners love shoes that disappear—like a phantom. Unfortunately, I noticed the HOVR Phantom every run. And walk. Yes, walking around in the Phantoms wasn’t pleasant either. Looking forward to taking them off isn’t what I hoped to write at the outset of this review, but the Phantom is an easy pass. Moreover, I think the heel collar and the heel counter need to be reworked in subsequent versions, assuming there will be one. Given the choice between the UA HOVR Infinite and HOVR Phantom, I’ll opt for the former. Please and thank you. Austin, who lives north of Atlanta, is also a husband, father, and writer. He loves Christopher Nolan films, NBC sitcoms, peanut M&M’S, and a good playlist for long runs. 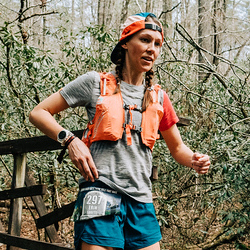 Erin is our resident female trail runner and enjoys running ultras all over the East Coast, in addition to her hometown of Baltimore. Check out her gnarly review of the Georgia Death Race here.